I'm having so much fun coming up with ideas for my Easter brunch. I decided to try making another wreath. 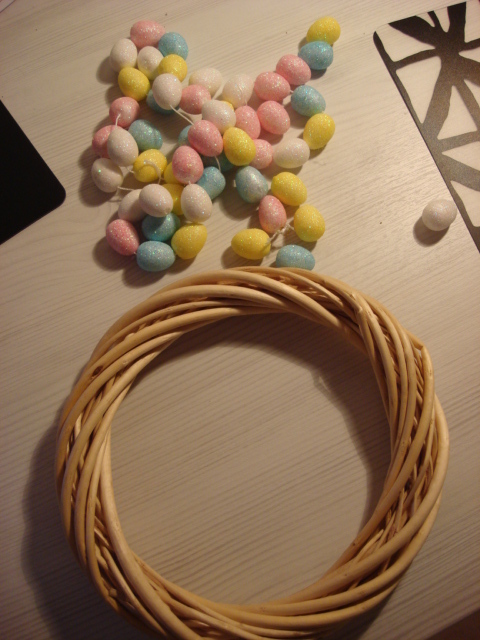 I had some leftover eggs from my Easter Wreath and a small wreath from the dollar store that I bought in December. I wrapped the wreath in a white ribbon and glued the eggs onto the wreath. I knew I wanted two rows all the way around, but I ran out of eggs. 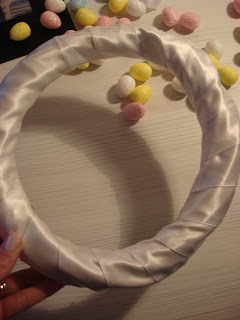 I did some fabric rosettes using fabric that I had on hand in matching colors to the eggs. Here it is. I wasn't sure if the flowers would work with the eggs, but I'm loving the idea. Easter and springy at the same time. It's so cute! And hosting an Easter brunch sounds delightful. I love how you mixed the eggs with flowers! Cute! oh! I totally love it! Oh how stinkin cute!!!!! I love it, you have inspired me to do some Spring decorating. Thanks for sharing. Turned out great, the fabrice roses are a nice addition. Thanks so much to linking up to Beyond The Picket Fence. too pretty! It looks great! Thanks for sharing @ Catch as Catch Can! Really lovely. 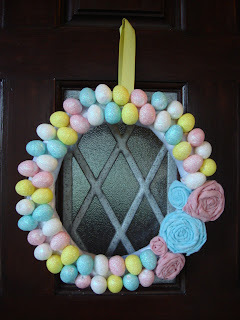 Looks so nice on your door as well. Love the spring colors! 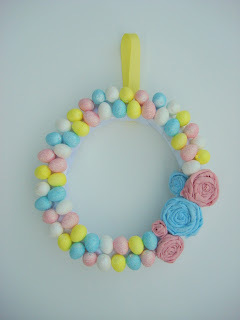 Love the rosettes, it looks beautful! Visiting from Tatertots & Jello. I sure wish that you made these to sell! I would just love one! I am having a spring craft linky party and giveaway on my blog this Friday. I would love for you to showcase this wonderful project. Details are on my blog today.